It's hard to believe that Sesame Street turned a whopping 40 this week. So many years, so much time to create corresponding children's books. I'd have to say that my favorite Sesame Street related book is The Monster at the End of This Book featuring lovable, furry old Grover. What a classic! When she was a baby my daughter also loved So Big! a Sesame Street beginnings board book. The pop-up surprise in the end always brought on big smiles and we even took it with us for her nine month photo shoot. Worked like a charm! Writer, editor, publicist P.J. Shaw [a.k.a. Meg McLaughlin] has authored her share of Sesame Street books, all published by Dalmatian Press. In a recent interview at WritingSnacks.com, she remarked, "My favorite things to do are to help aspiring authors get published and write Sesame Street books. I would live on Sesame Street if I could." We recently had the chance to review a few of Shaw's books. Storybook ABCs is an adorable blend of fairy tales, nursery rhymes, the ABCs and famous Sesame Street characters all combined together in one little paperback book. 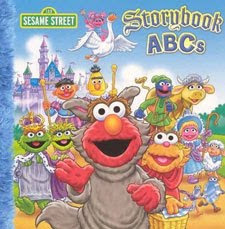 Starting with the letter A and ending with Z, each page shows Sesame Street characters role playing in beloved tales and rhymes. For instance, the letter S page depicts the Count and Countess gazing up and counting the stars, along with an accompanying poem, a sparkled up version of "Twinkle, twinkle, little star." Author McLaughlin writes with humor and wit and makes sure that each page contains several words starting with the featured letter. I really enjoyed reading this book with my preschooler. We had fun discussing all the tales and rhymes in the book. While my daughter loved looking at all the colorful illustrations and checking out all the words, I probably appreciated the silly text even more than she did. I'm all for changing the words to familiar rhymes, so long as the reader already experienced the originals. Extending rhymes encourages creativity and there is plenty of that in this book. Some favorites of mine include CinderElmo, the three little pigs named Pear, Plum and Peach and Miss Muffet's mud soufflé. My daughter like T for Tower, with Grover trying to climb up Zoe's long hair and exclaiming, "Um...what a tremendous tower to tackle." The word "fútball" had me a little confused though...is that the correct Spanish term for soccer ball? Either way the book is a fun, lighthearted addition to our nursery rhyme book collection. P.J. Shaw also adapts children's books for younger readers. One of her newest books, My First Alice's Adventures in Wonderland (A Touch & Feel & Sparkle Book) takes little ones on a short adventure in Wonderland. Five pages of text summarize the classic story so that toddlers and preschoolers can learn about Alice and a few of the other characters. The touch and feel pages show a fluffy-eared White Rabbit with pink eyes, Alice falling into a well lined mirrors, a sparkly Caterpillar on a mushroom, a soft Cheshire Cat, and the Mad Hatter wearing a satin bow tie. 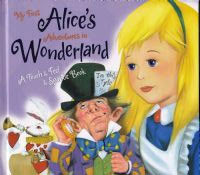 With Tim Burton's Alice in Wonderland movie releasing early next year, this book is a fun, interactive way to introduce and teach young children about the classic story. In celebration of Sesame Street's 40th anniversary, P.J. 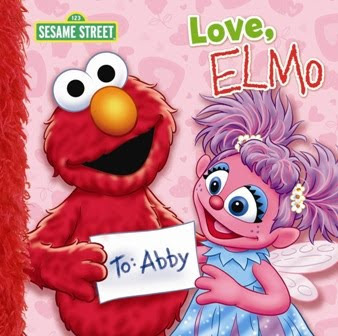 Shaw [Meg McLaughlin] has kindly offered to give away a signed copy of one of her Elmo Sesame Street books: Love, Elmo illustrated by Tom Brannon. To enter, leave a comment with your favorite Sesame Street character or favorite Sesame Street book. • Contest ends on Monday, November 30th, 2009 at 11:59 PM CST. Elma is so cute and kids love him. I also love Lola from teh Spanish sesame street. We love Elmo in this house! I love Grover! And he's the star of my favorite Sesame Street book, There's a Monster at the end of this book. We love Elmo! And Oscar the Grouch! My son just loves to play sesame street games online, and I know he would love this book! I am really loving Murray right now (Murray has a little lamb...)! He's such a fun character. My daughter loves Elmo. Books about Elmo go over big in this house. I'm a follower through Google Friend Connect and on Twitter. Telly Monster has always been a favorite in our neck of the woods! My favorite Sesame Street character is Abby Cadabby. She is too cute!! My favorite character is Ernie. Please enter me. Thanks! I love There's A Monster At The End Of This Book. Our favorite Sesame Street book, hands down, was There's a Monster at the End of this Book! We love Abby Cadabby around here!! Thanks. I love Oscar (and Slimey too, of course)! Cookie Monster is my favorite. My favorite character is Telly Monster! My favorite character is Oscar the Grouch. Thanks. Wow! I didn't know that Sesame Street was 40 years old. That means it was only a year old when I was born. Pretty cool. Let's see my favorite character/puppet is.... Snuffy... well, you know who I mean. Big Bird's best friend. As a kid I loved "There's a Monster at the End of This Book" featuring Grover. My favorite character as a child was Grover. But, my daughter is a die-hard "mElmo" fan. My favorite sesame street characters are Ernie and Bert! This would be for my toddler, thanks! The Monster at the End of the Book is our favorite Sesame Street book around here! I love all of the characters!! I love Oscar, Abby Cadabby, Elmo, Big Bird, etc. What's not to love?! I like them all but I will say elmo. i'm following with google friend! My granddaughter loves Elmo but I've always been a fan of Big Bird.